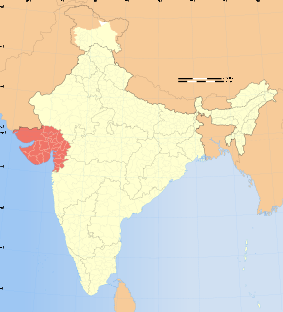 Gujarat gets its name from “Gujjar Rashtra” or “Gujjaratta”, the land of the Gujjars. It is situated on the western coast of India. They were a migrant tribe who came to India in the wake of the invading Huns in the 5th century. The history of Gujarat dates back to 2000 BC. Settlement of Indus valley, which is known as Harappan Civilization is in Gujarat. Some of the coastal Cities, mainly Bharuch, served as ports and trading centers in the Maurya, Gupta, Pratiharas etc but it was under the regime of Chalukyas (Solanki) Gujarat witnesses’ progress and prosperity. In the 6th century Gupta Empire failed and Gujarat flourished as an independent Hindu Kingdom. After this glorious respite, Gujarat faced troubled times under the Muslims, Marathas and the British rules. Bhatarka shifted his capital from Giringer to Valabhipur, near Bhavnagar, on Saurashtra’s east coast. They became powerful in Gujarat as well as Malwa. Maitrakas set up a university which came to be known far and wide for its scholastic pursuits and was compared with the famous Nalanda University. The Maitrakas ruled from their capital at Vallabhi. They came under the rule of Harsha in the mid-seventh century, but retained local autonomy, and regained their independence after Harsha’s death. Siladitya I was the son of Dharsena II, Dharmaditya was described by Hiuen Tsang as a “monarch of great administrative ability and of rare kindness and compassion”. He died in 996. At the time of his death, his kingdom included saraswat and satyapur mandals, kutchh and some territories of Saurashtra. . His reign marked the start of a period during which Gujarati culture flowered as manifested in art, architecture, language and script. It is described as the golden period of Gujarat’s chequered history. His son Chamund started taking responsibility during his ruling (977). Vallabhraj attacked King Sindhuraj’s territory as soon as he became king. He died due to small pox in the war only. Durlabhraj (brother of Vallabhraj) could not extend father’s kingdom much. He married the sister of Chauhan Baliraj’s son Mahendra of Naddul. He was of good character. He invited Jain saints in his kingdom and continued as Samant of Malav king Bhoj. After his death, his nephew Bhimdev (son of Nagraj) became king in 1022. Bhimdev I was son of Durlabhraj’s brother Nagraj. Bhimdev was a mandlik of Malav king Bhoj. Bhimdev added Saurashtra, Kutchh, Abu and some parts of Khetak mandal and Mahimandals with his kingdom. Bhimdev became independent from Bhoj on his death in 1054. Bhimdev had a son named Karndev from Udaymati (a pricess of Saurastra Narvahan Khengar) and sons named Xemraj and Mulraj from Bauladevi (also called Chauladevi). Mulraj died in very early age. Bhimdev died in 1064. Karndev (Bhimdev’s son by Udaymati) came on the throne after Bhimdev’s death. Karndev came on the throne after Bhimdev’s death. He is described as a very handsome king. As soon as he came to the throne, he made friendship with King Someshwar of Kalyani. Up to 1075, he added entire Lat in his kingdom. His territories were touching Konkan in south and Naddul in north. He married to Karnataka’s king Tribhuvanmalla’s friend Jaykeshi’s daughter Mayanalladevi(Minaldevi). Jaykeshi was Konkan’s suba. Karn had built many temples, lakes and cities like Karnavati. Shakambhari’s king Dushshal chauhan defeated and killed Karn in a war. Malavking Laxmdev and Naddul king Joggal helped in defeating Karndev. Patan’s condition was worse in the last days of Karandev. His son Jaysinh became Karandev’s successor for the throne. Siddhraj Jaysinh was also known as Siddhraj Solanki who was considered as the most prominent Solanki king. His mother Minaldevi , Maha Mantri Santu and Munjal Mehta initially played a great part to deter the internal revolt and in establishing his rule and stability to Patan in Gujarat. Jaysinh came on throne in 1096. So the years between his father’s death and his actual takeover might have been guarded by his mother and his mantris. Apart from Saurashtra and Kachchh, Siddhraj Jaysinh had also conquered the Malwa defeating king Yashovarma. He adorned the title of “Barbarak Jishnu” and also “Siddhraj” after controlling Bhil king Barbarak. He became Chakravarti after acquiring total control of the region under old Gurjar Chakravarti kings. He renovated and widened the lake constructed by Durlabhraj and named it as Sahastraling Lake. He constructed two lakes in the memory of his mother. He also renovated Rudramahal. During his kingdom Patan flourished in education, religion and commerce. He gave shelter to many scholars of different religion and castes. Other notable figures of his time included his, Prime Minister Munjal Mehta, Kak and leading Courtier Udayan Mehta. Siddhraj Jaysinh died in 1143. The throne remained without King for 18 days. Thereafter Kumarpal was suddenly declared King of Patan. Siddhraj Jaysinh did not have any son. His daughter’s son Someshwar was brought up by him in Patan. But many Mantris like Dadak, Madhav, Sajjan and Udayan were of the opinion that decedent of Mulraj and Bhimdev should be made King of Patan. Siddhraj Jaysinh hated this proposal. Kumarpal was the probable candidate being decedent of Bhimdev by his second wife Bauladevi. Hence Kumarpal was under direct wrath of Siddhraj. Kumarpal had to flee and hide from Siddhraj for 30 years to save his life. There were many internal fights for Patan’s throne. After Siddhraj Jaysinh’s death, Kumarpal was ultimately given throne of Patan in 1144. Kumarpal had to face much resistance. He along with his able mantries took harsh steps to subside the resistance. Many mantries opposing him were given death sentence. Kumarpal adopted Jain religion in 1160 along with Shiv religion. He became vegetarian and stopped animal slaughter. He built 1440 Jain Vihars. He renovated Somnath temple. In his old age he reduced interest in administration and left it to his faithful samants and mantries. Again internal conflicts for throne have surfaced. One of the group wanted Kumarpal’s nephew Ajaypal ( Mahipal’s son) as a king. Ajaypal came on throne after a revolt in 1173. Kumarpal died in early 1174 due to poison given to him. Kumarpal’s nephew Ajaypal (1173-1176) ( Mahipal’s son) came on throne after a revolt in 1173. He was very shrewd and merciless. He got rid off all people connected to Kumarpal. During his period Patan’s kingdom remained from Gwaliar to Narmada River. He discouraged Jain saints and leaders. A pratihar named Vayjaldev injured Ajaypal with a dragger. Ajaypal died in 1176 due to this injury suffering a lot. His child son Mulraj was given Patan’s throne on his death. India was passing through a great turmoil when Bhimdev came to throne. Gahadwal of Kanoj, Chandelas of Jejabhukti, Yadavs of Devgiri and Kalyani’s Chalukyas were Bhimdev’s (Patan’s) stern enemies. He adorned himself as “Abhinav Siddharaj”. Malav king Subhat varma invaded Gujarat in 1209. Bhimdev fled to either Saurashtra or Kutchh. Between 1209 and 1226, a brave Chalukya named Jaisinh/ Jayansinh took over the kingdom of Gujarat (Patan), probably to save Patan in absence of Bhimdev. In 1226, Bhimdev again came on the throne of Patan. Mantri Vastupal , Maha mandleshwar Lavanprasad and his son Virdhaval played an important role in bringing Bhimdev to throne. They virtually ruled Patan even though Bhimdev was a king. In the old age of Bhimdev, Virdhaval’s son Visaldev and Vastupal’s brother Tejpal took the charge to rule Patan. Bhimdev died in 1241. His son, Tribhuvan pal, was made king after him. Tribhuvan pal, son of Bhimdev II was a king for namesake. In fact, Visaldev and Tejpal ruled Patan. During this period, Tejpal persuaded ambitious Visaldev from dethroning Tribhuvan pal and continue ruling in his name. Tribhuvan pal died in 1244. Visaldev took over the throne as a king. Thus the Solanki dynesty came to an end. Visaldev being a decedent from Arnoraj Vaghela’s son Lavanprasad, Vaghela dynesty ruled Patan there after. Initially in ancient Vedic society, this positions was achieved on the merits of a person’s aptitude (guna), conduct (karma), and nature (swabhava). Over the years it became hereditary.